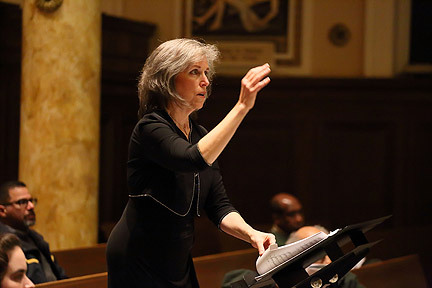 The award-winning conductor, Deborah Simpkin King, leads the Global Tapestry, a concert that inspires togetherness at the church of Immaculate Conception. Global Tapestry: A musical discussion about immigration. Photo courtesy of Peter Chollick Photograpy. 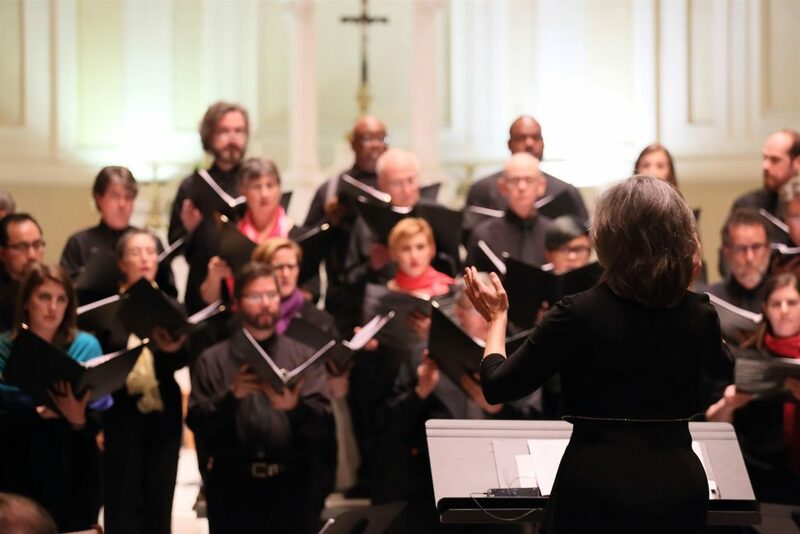 On the evening of Sunday, May 22, award-winning conductor Deborah Simpkin King will lead a Schola Cantorum on Hudson concert at the Church of the Immaculate Conception. “Schola” is a conscious choral ensemble that includes both professional and amateur vocalists. The group focuses primarily on new music with socially pertinent programming. Their concert, Global Tapestry, surrounds the theme of immigration—a topic Dr. King is excited to explore through music. Global Tapestry seeks to connect us all through sound and movement. The musical concert draws on theatrical elements that will choreograph the piece. There is also a special added component of the performance accessible on smartphone devices to enhance the musical experience. “We’re looking to open up the conversation about citizenship. We are a land of immigrants and that’s how our country got its form. We’d like to explore what it means to be an immigrant and engage this notion of patriotism. I’d like for our audience to take away an experience. Our group is a catalyst for making others feel and think about things,” stated Dr. King. The classically-trained members of Schola are using their skill and technical ability to perform modern pieces from pop and folk eras. Sources of inspiration include Judy Collins, Irving Berlin, Neil Diamond and Brendan Graham. Perhaps the most fascinating part of the evening will be the global debut of break-out composer Jake Runestad’s newest single, “One Flock”. Runestad will appear at the Global Tapestry concert and speak about 15 minutes before it begins. Working with Runestad is something new for Schola, but it has inspired great results. “Any time you’re doing a world premiere, you’re doing a major event. This is especially when working with an amazing composer, which is what we’re doing. It’s a real privilege to share with Jake,” said Dr. King. Originally from Minnesota, Runestad has received widespread critical acclaim for a number of his works. Honors from such groups as the American Composer’s Forum, the Peabody Conservatory and the American Society of Composers, Authors and Publishers have kept coming for 30-year-old Runestad—making him an artist to watch. A relatively young contender in his field, Runestad has received commissions from the Washington National Opera, Louisiana Philharmonic Orchestra and the Virginia Arts Festival. His most recent project has brought him to Montclair, N.J.
“If I could tell people are considering something to do with their Sunday afternoon, I’d say come expecting the unexpected and you will not be disappointed,” said Dr. King. Global Tapestry will take place at the Church of Immaculate Conception at 30 N. Fullerton Ave. in Montclair at 5 p.m. Tickets are $20 in advance and $25 at the door. Children 12 and under are admitted free of charge. Tickets are available online at scholaonhudson.org and by calling 888-407-6002, ext. 5.